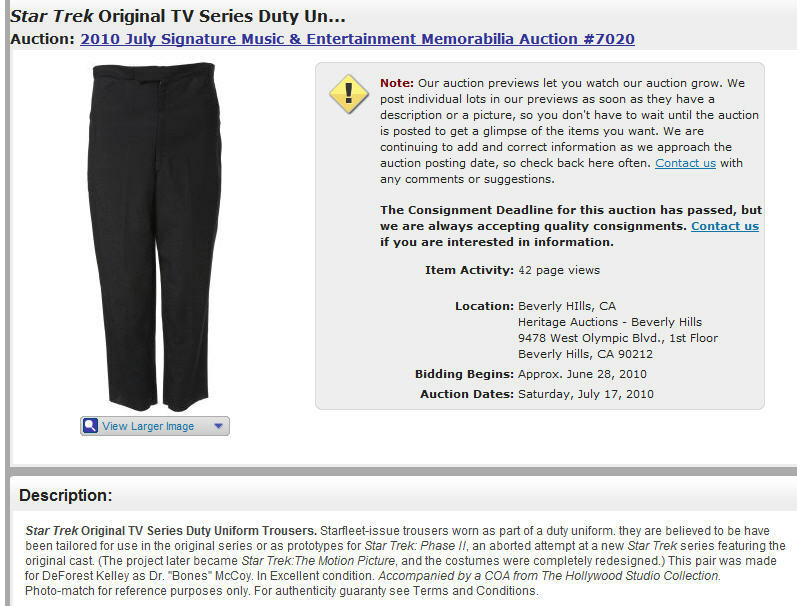 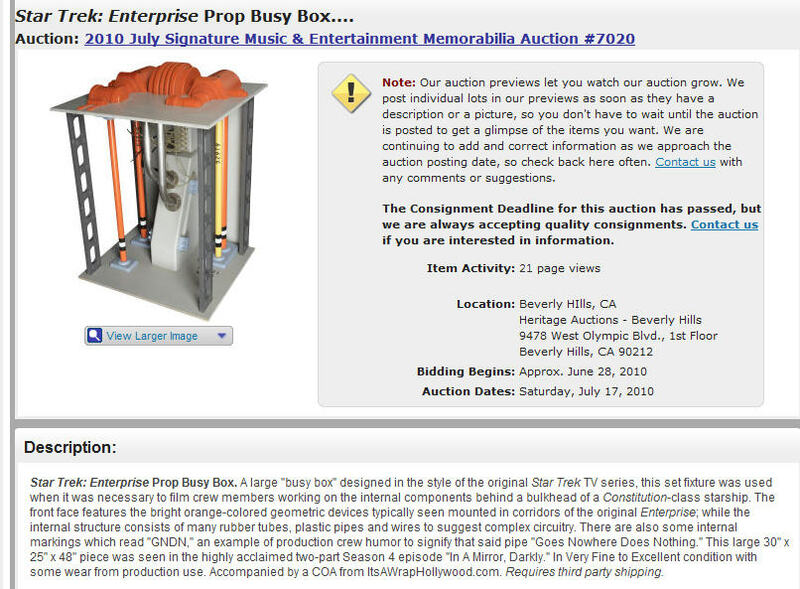 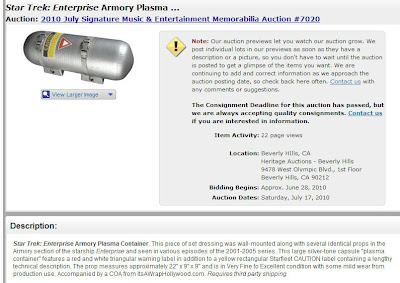 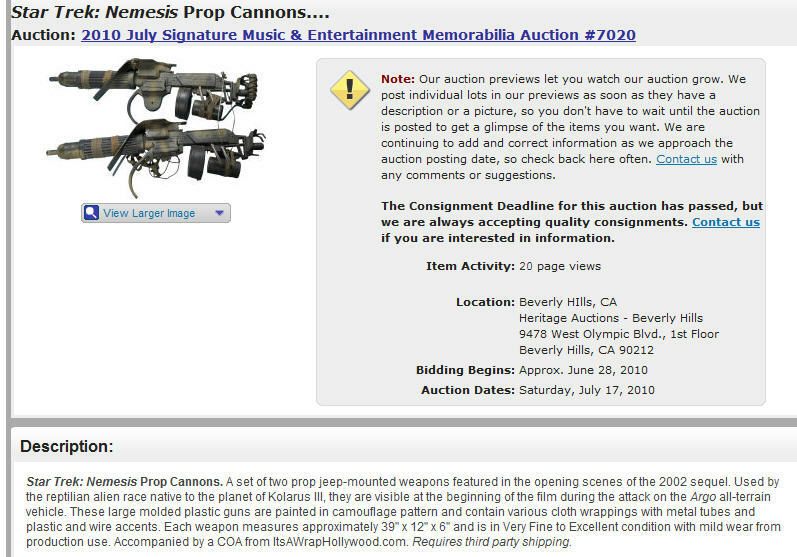 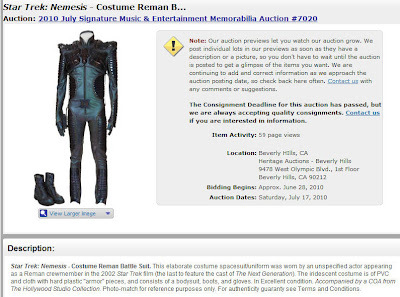 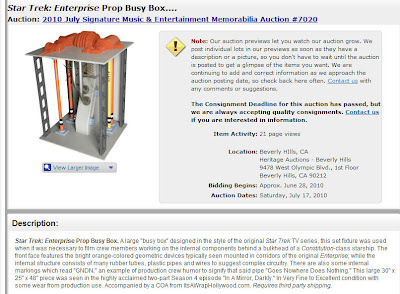 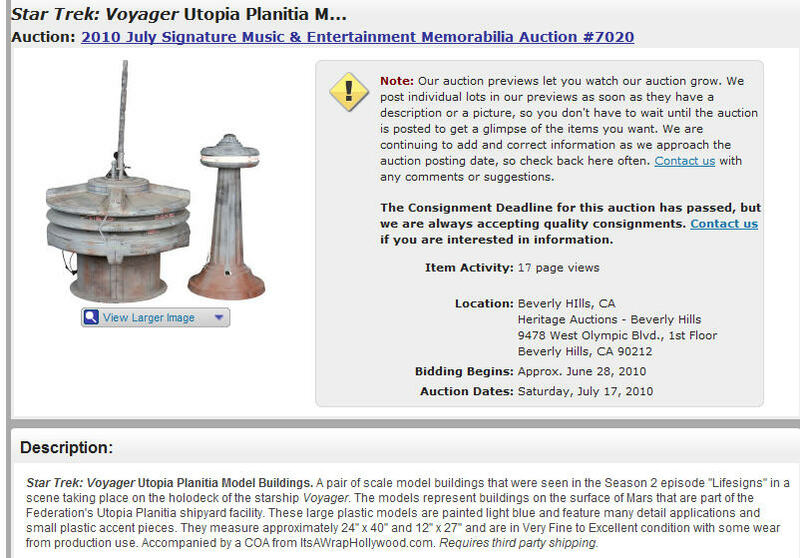 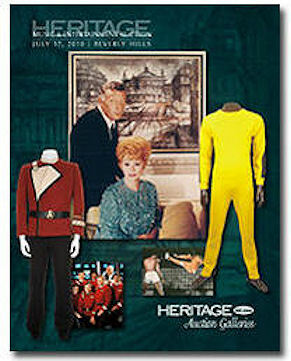 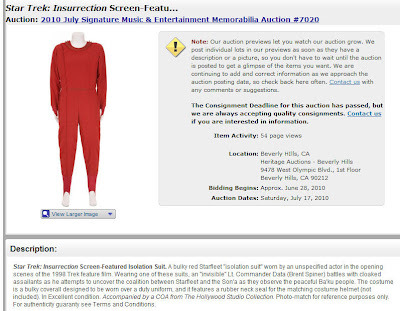 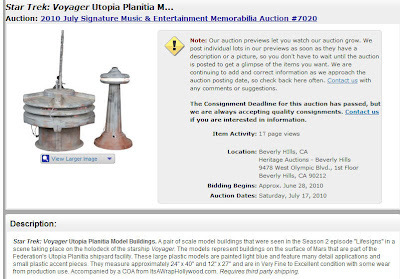 On July 17, 2010, Heritage Auction Galleries (http://www.ha.com) will be holding a large Music & Entertainment Memorabilia Sale at its Beverly Hills, CA location. 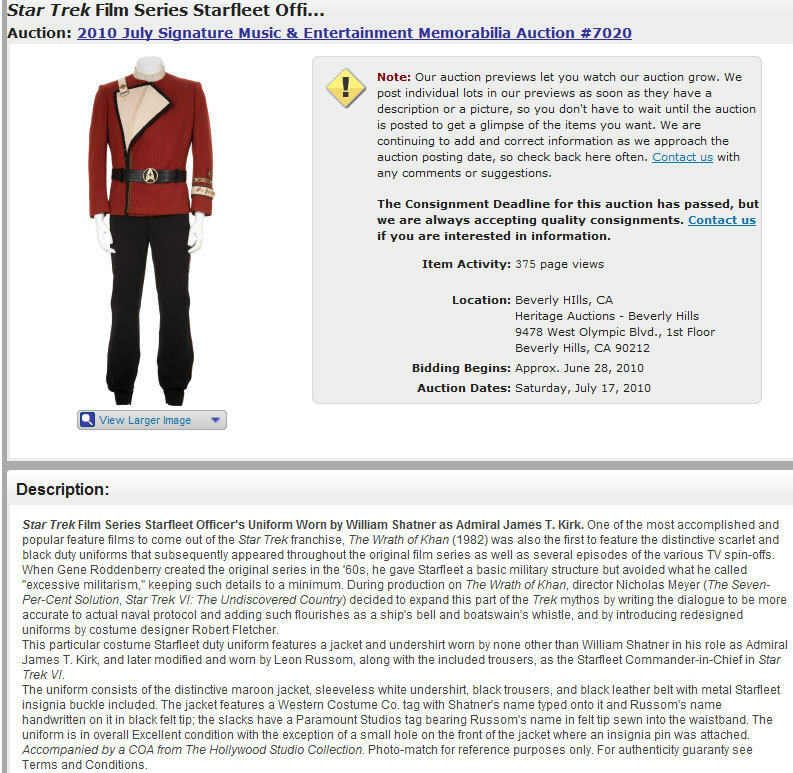 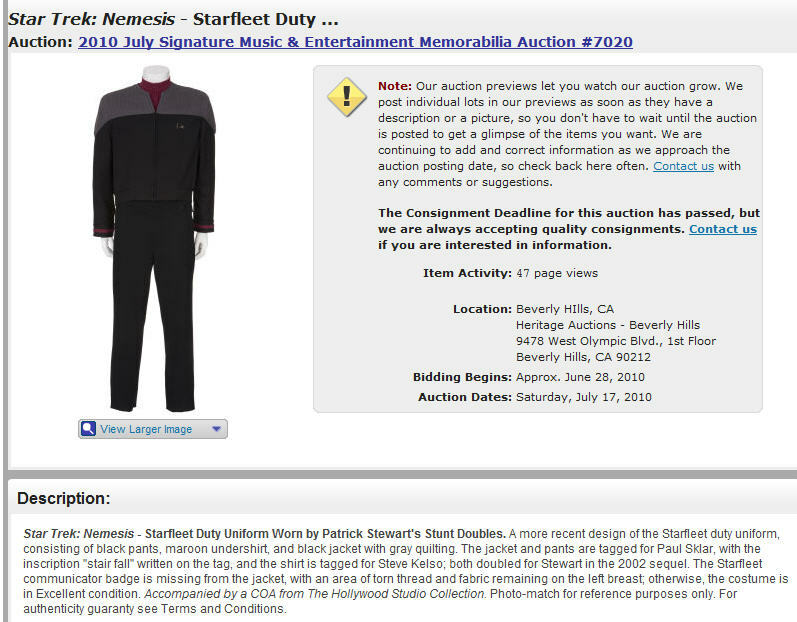 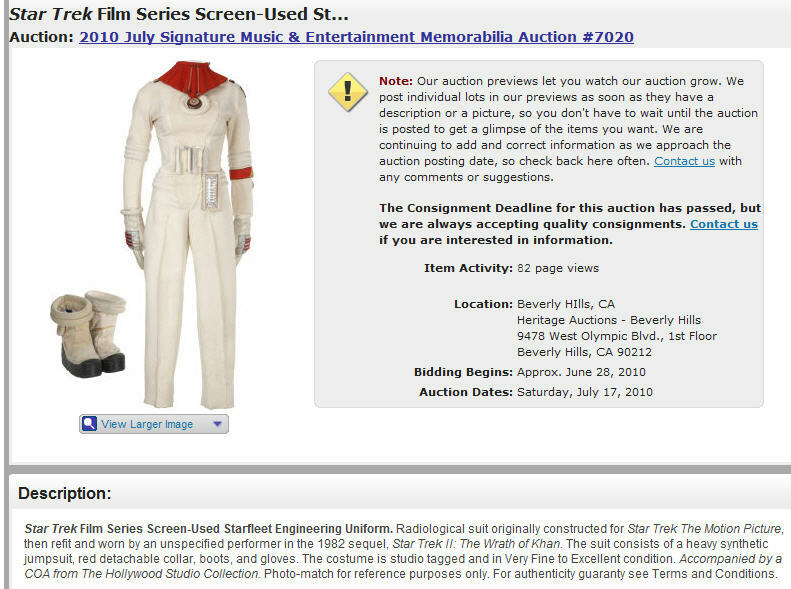 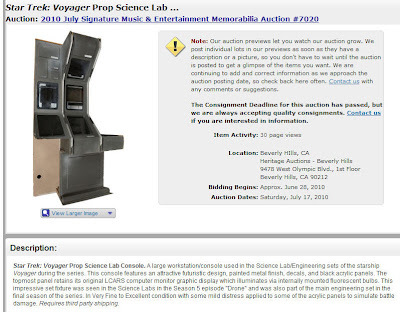 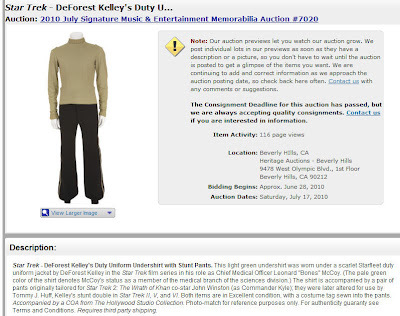 This auction will feature a total of 26 lots of Star Trek memorabilia - including a Shatner-worn maroon Starfleet Officer's Uniform from the original cast feature films, a Patrick Stewart Stunt Starfleet Duty Uniform from Nemesis, a Reman warrior costume from Nemesis, a large Star Trek: Voyager Science Lab Console, a Federation Phaser Cannon used in the Argo all-terrain vehicle in Nemesis, and some large Voyager LCARS Bridge and Engineering panels. 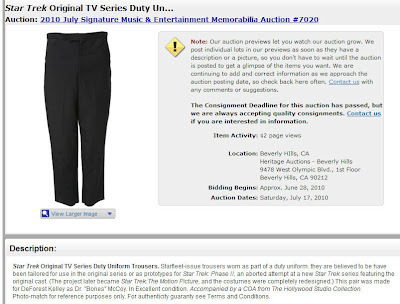 The auction will be streamed online, and those wishing to bid live online may sign up for a free account at the Heritage Auctions website and register for the sale. 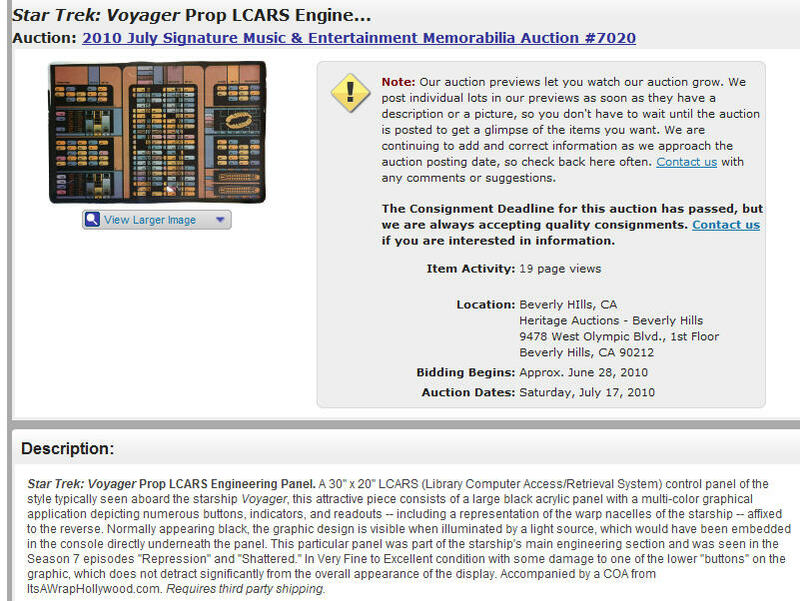 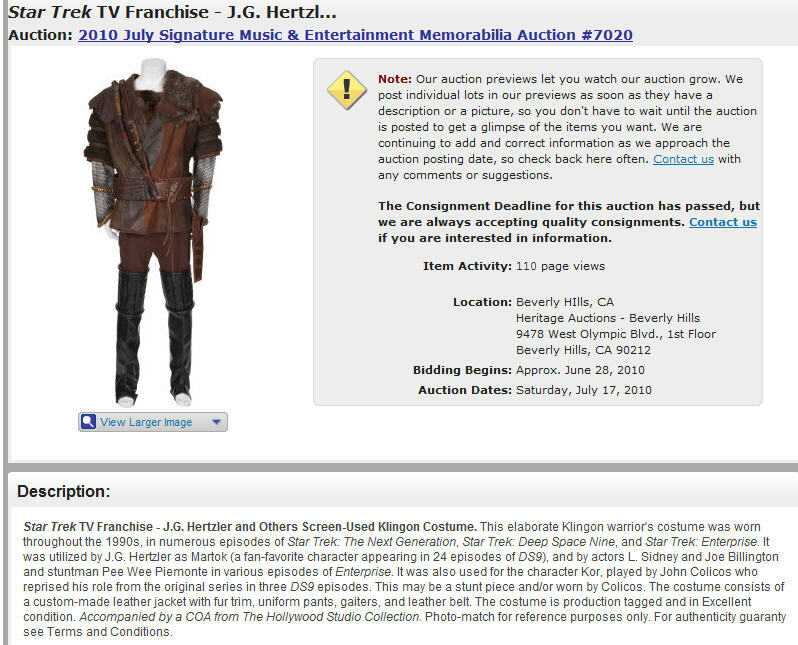 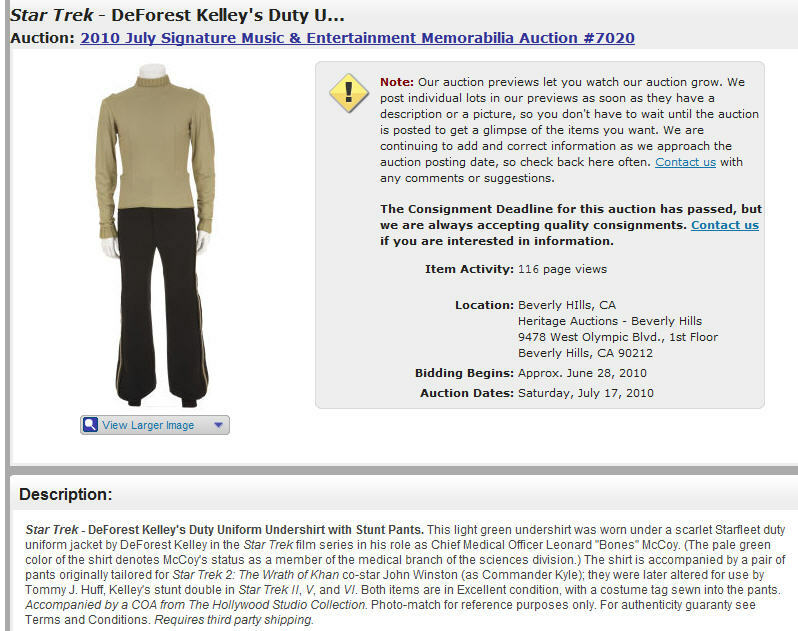 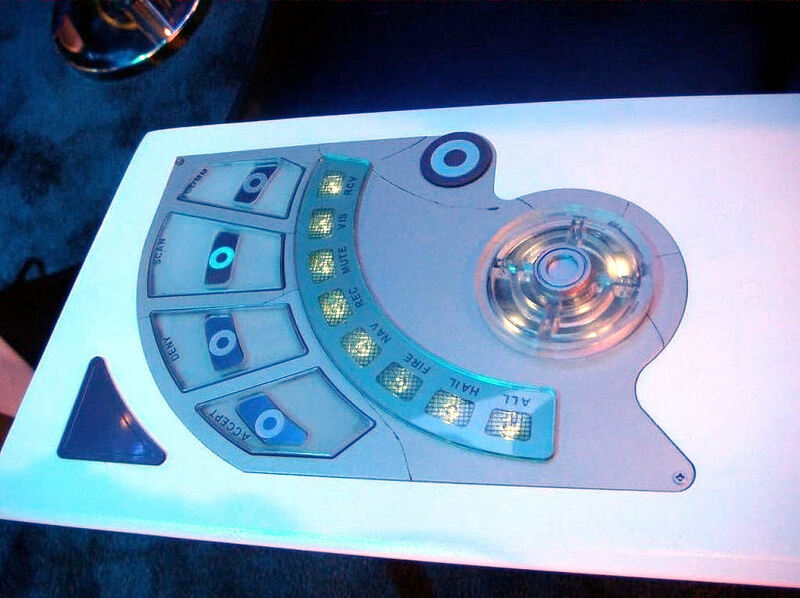 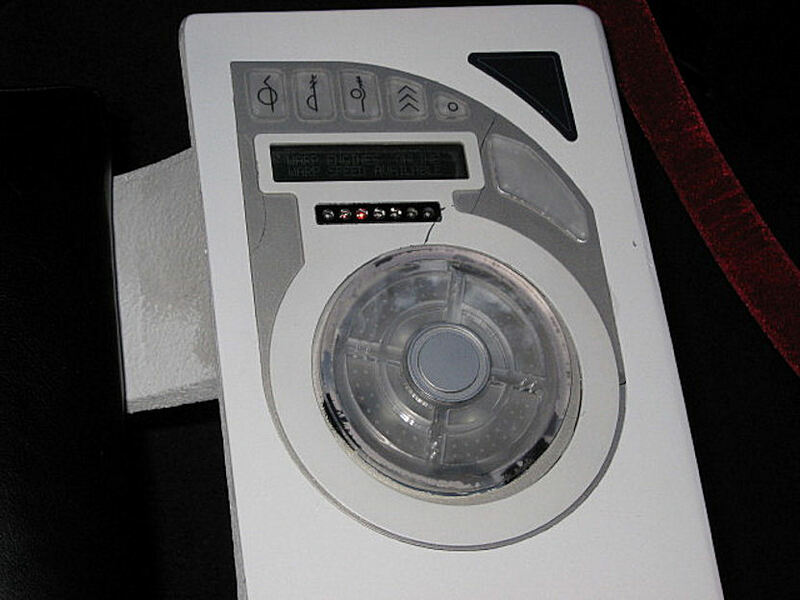 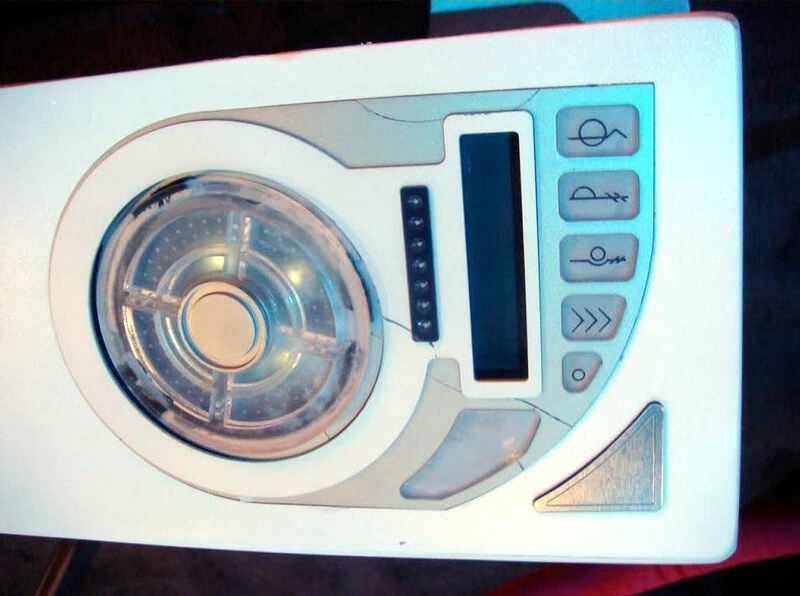 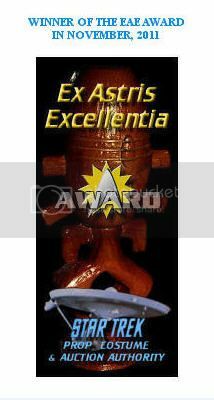 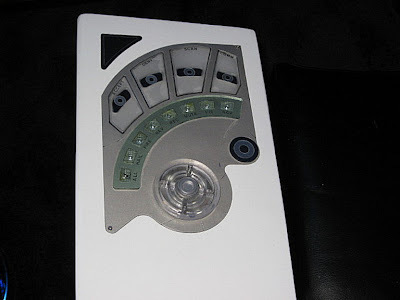 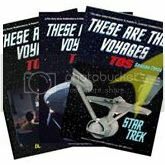 Below are some highlights of the Star Trek memorabilia to be offered. Some readers might recognize several items as the subjects of photos/articles on this website. 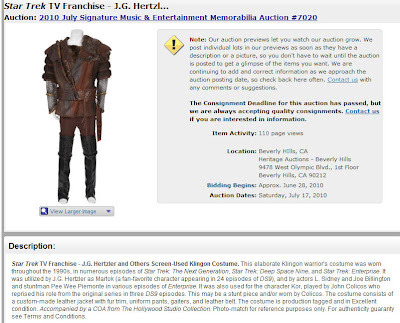 Indeed, multiple lots in the July Heritage sale are from my collection. 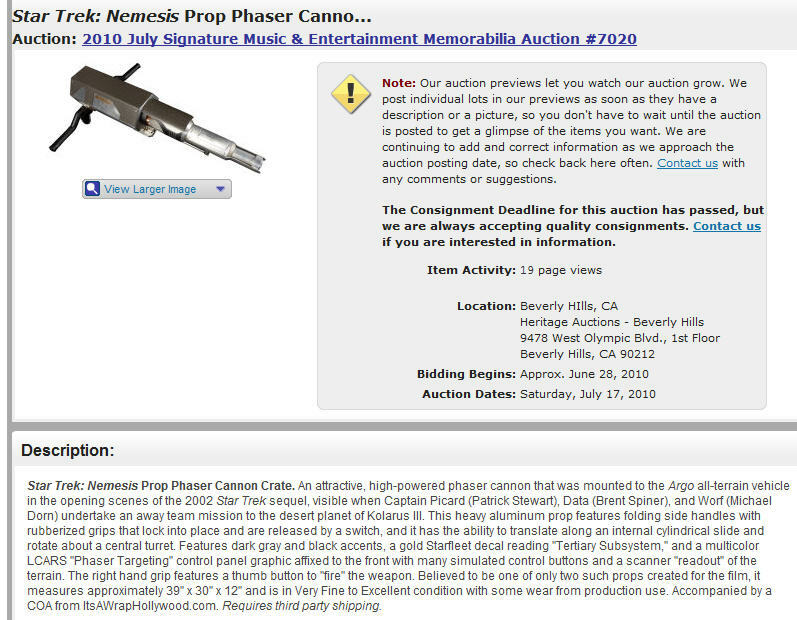 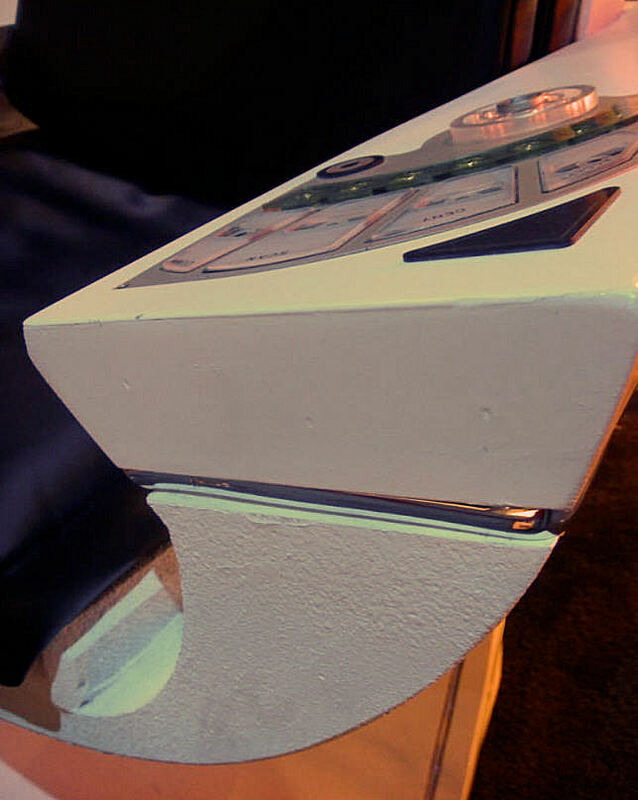 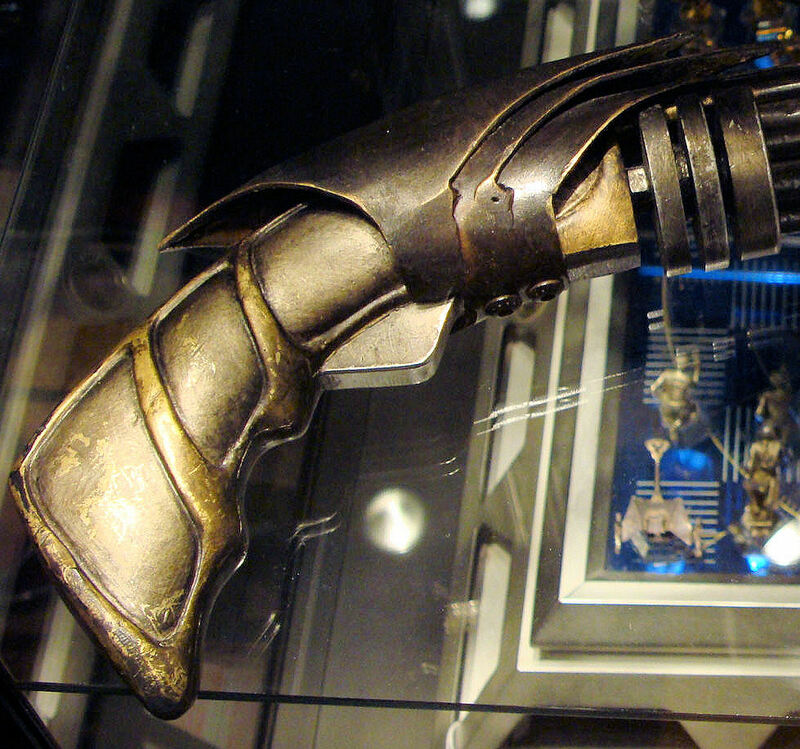 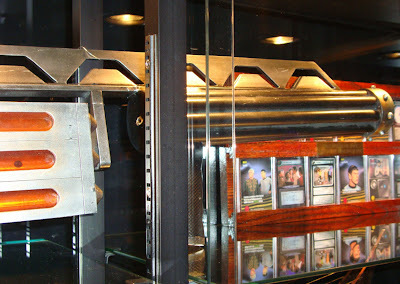 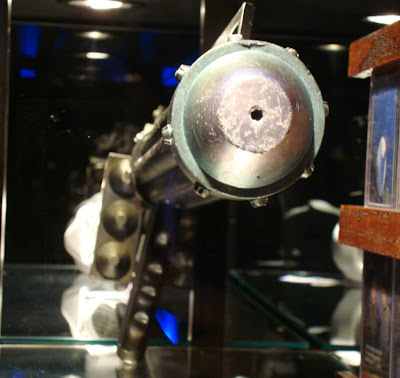 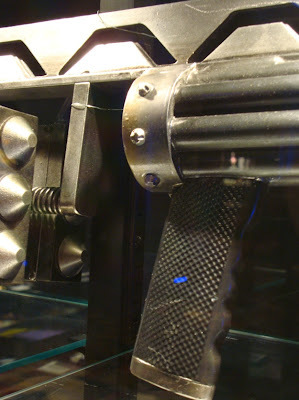 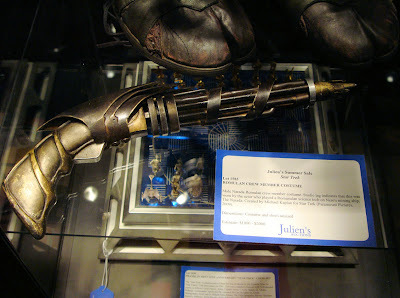 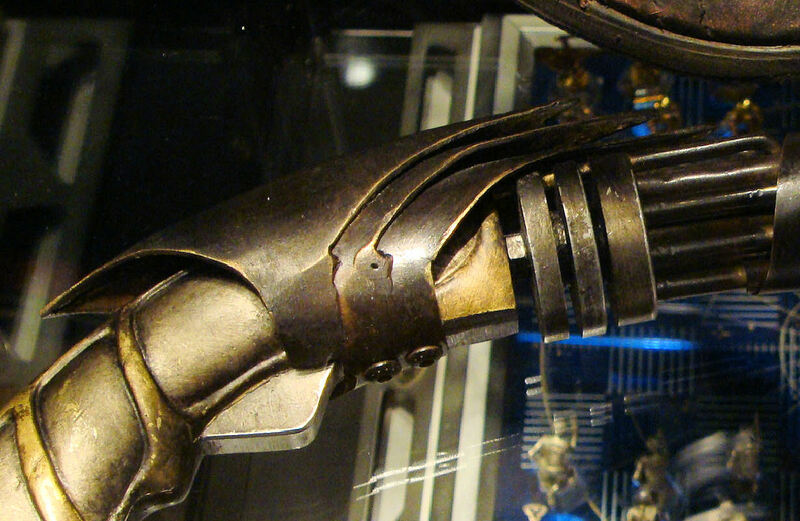 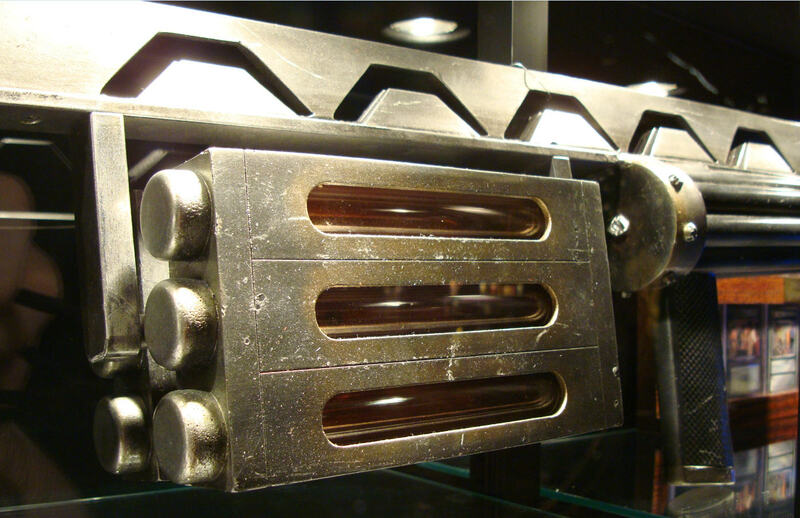 This screen used Romulan Phaser Pistol from Star Trek (2009), directed by J.J. Abrams, is presently on display at a 10 day exhibition of hollywood and music memorabilia - hosted by Juliens Auctions (http://www.juliensauctions.com) - that is taking place at the Planet Hollywood Resort and Casino in Las Vegas, Nevada. 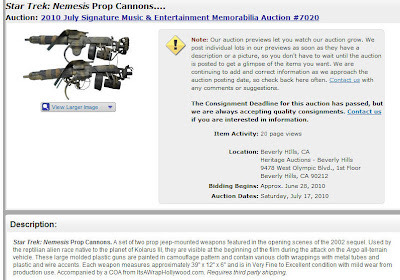 The exhibit runs from June 14, 2010 - June 24, 2010, and will be followed by a series of auction events on-site. 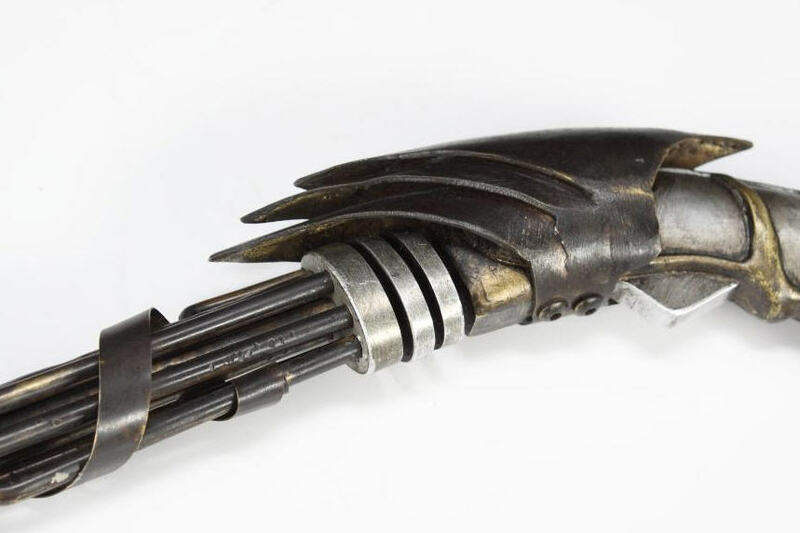 The Romulan Pistol will be part of the Star Trek Auction, featuring property from the Estate of Gene Roddenberry, on June 27, 2010. 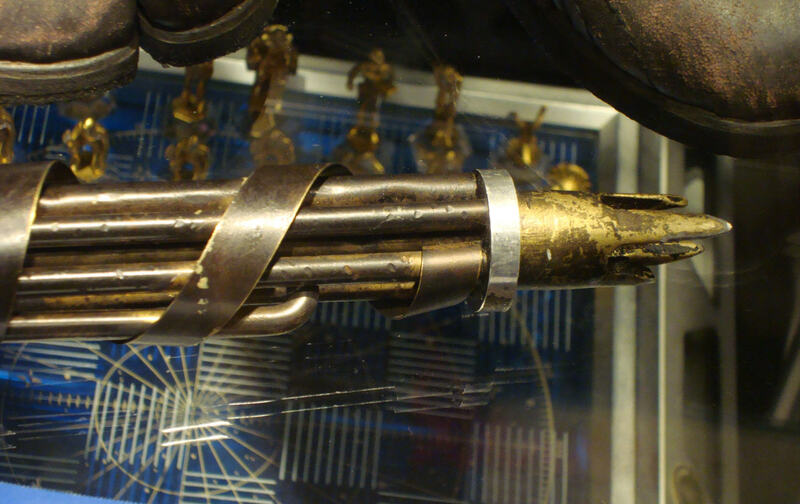 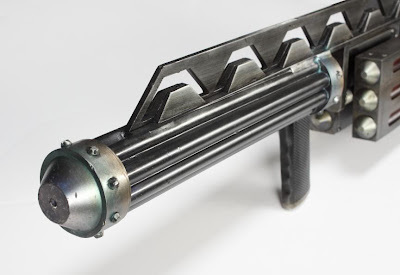 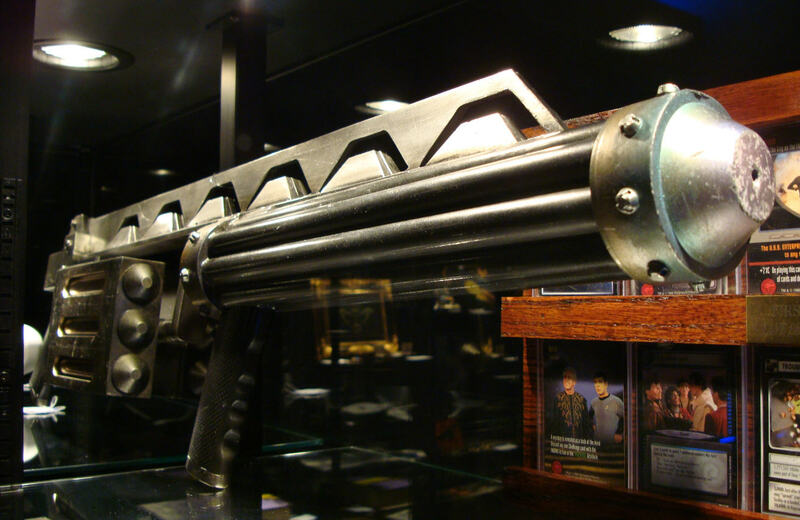 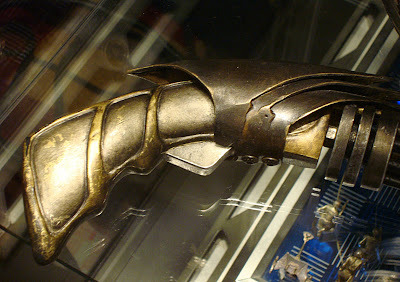 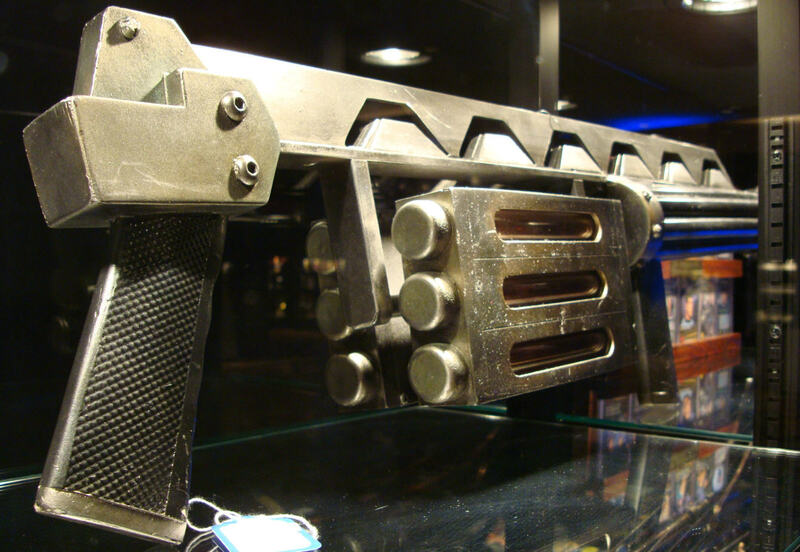 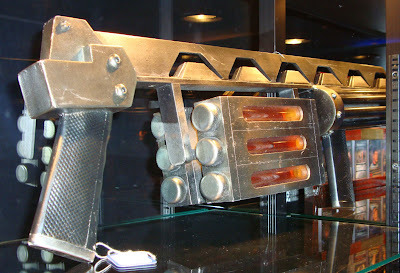 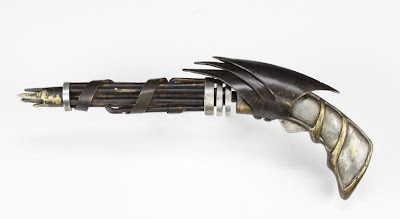 This Klingon Disruptor Rifle created for Star Trek (2009), directed by J.J. Abrams, is presently on display at a 10 day exhibition of hollywood and music memorabilia - hosted by Juliens Auctions (http://www.juliensauctions.com) - that is taking place at the Planet Hollywood Resort and Casino in Las Vegas, Nevada. 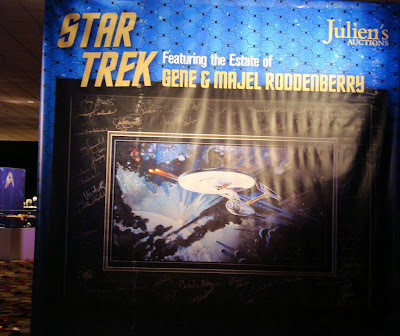 The exhibit runs from June 14, 2010 - June 24, 2010, and will be followed by a series of auction events on-site. 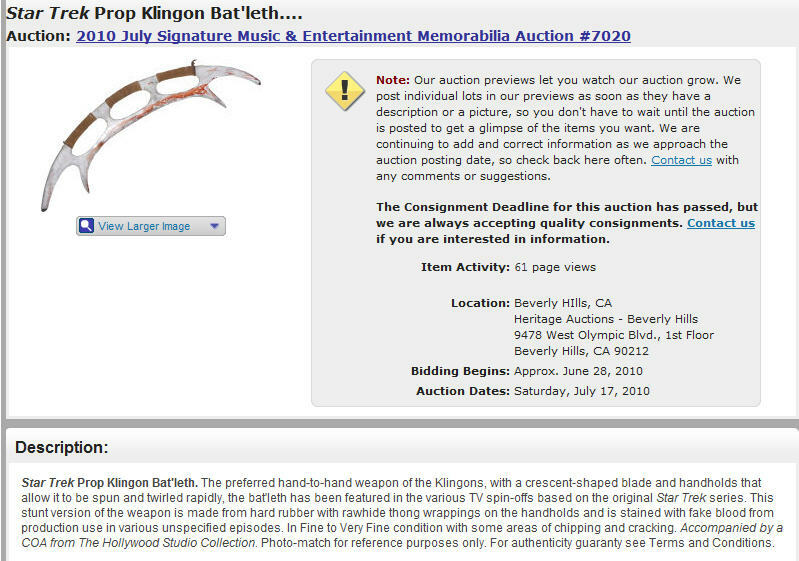 The Klingon Rifle will be part of the Star Trek Auction, featuring property from the Estate of Gene Roddenberry, on June 27, 2010. This screen used U.S.S. 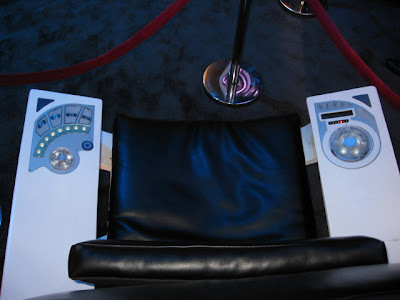 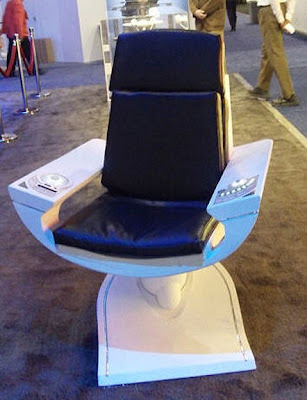 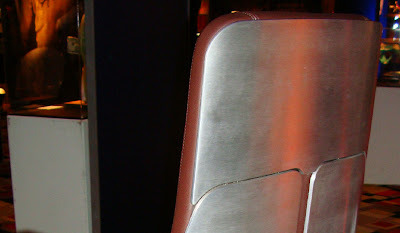 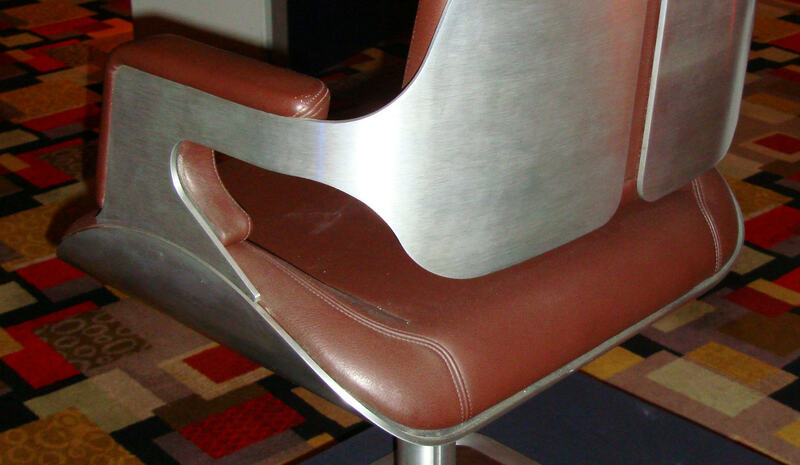 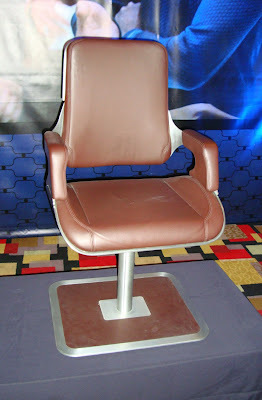 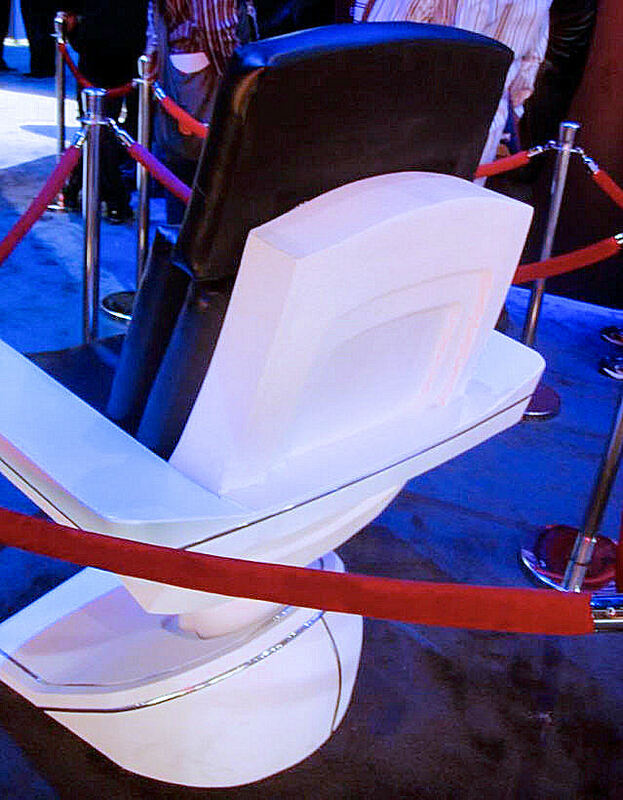 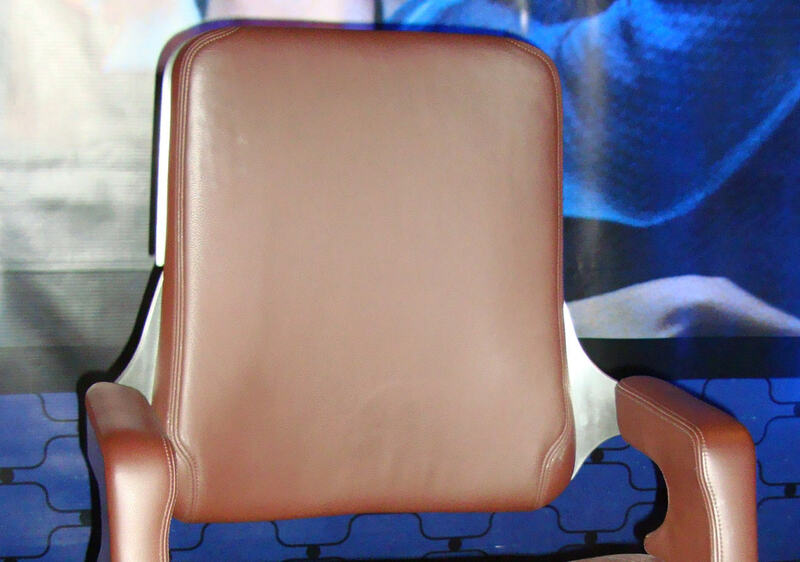 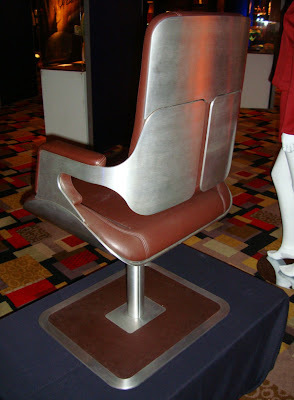 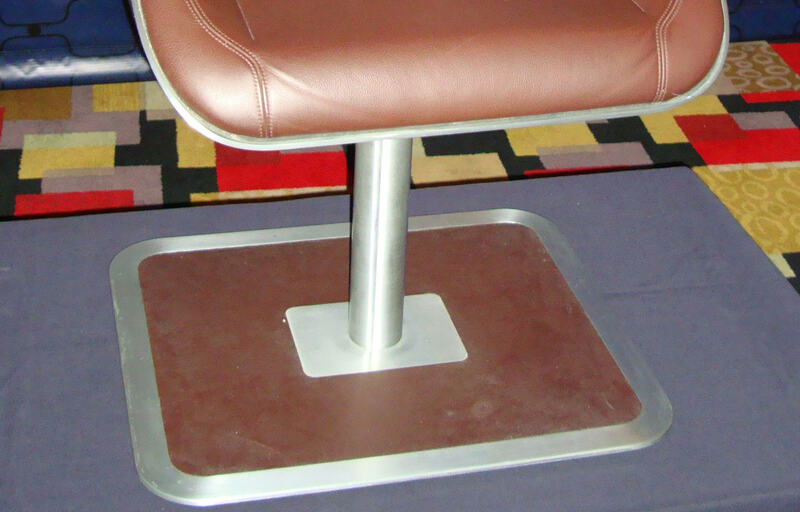 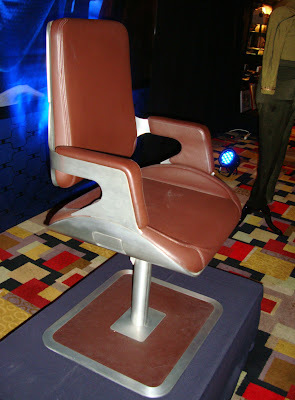 Kelvin Bridge Chair from Star Trek (2009), directed by J.J. Abrams, is presently on display at a 10 day exhibition of hollywood and music memorabilia - hosted by Juliens Auctions (http://www.juliensauctions.com) - that is taking place at the Planet Hollywood Resort and Casino in Las Vegas, Nevada. 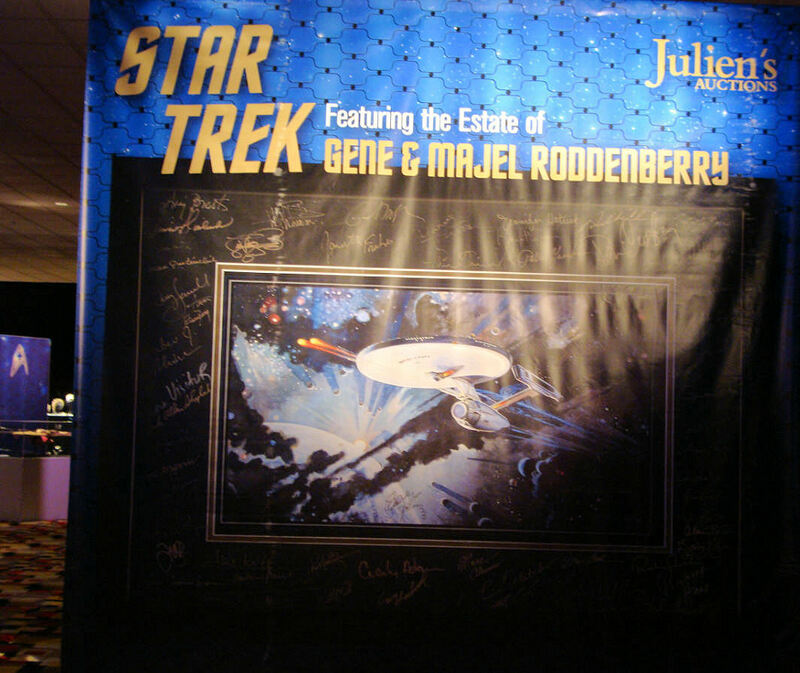 The exhibit runs from June 14, 2010 - June 24, 2010, and will be followed by a series of auction events on-site. 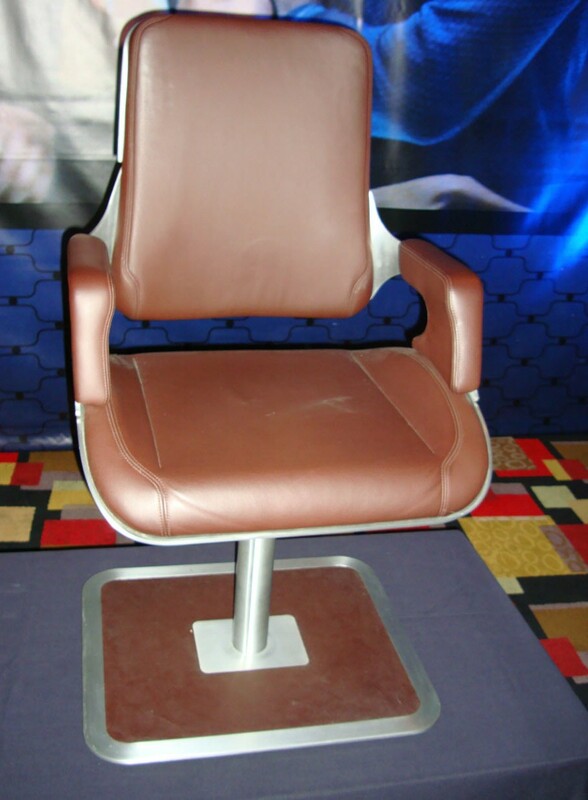 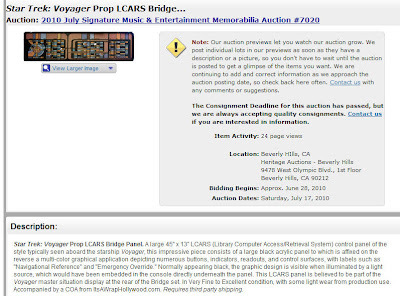 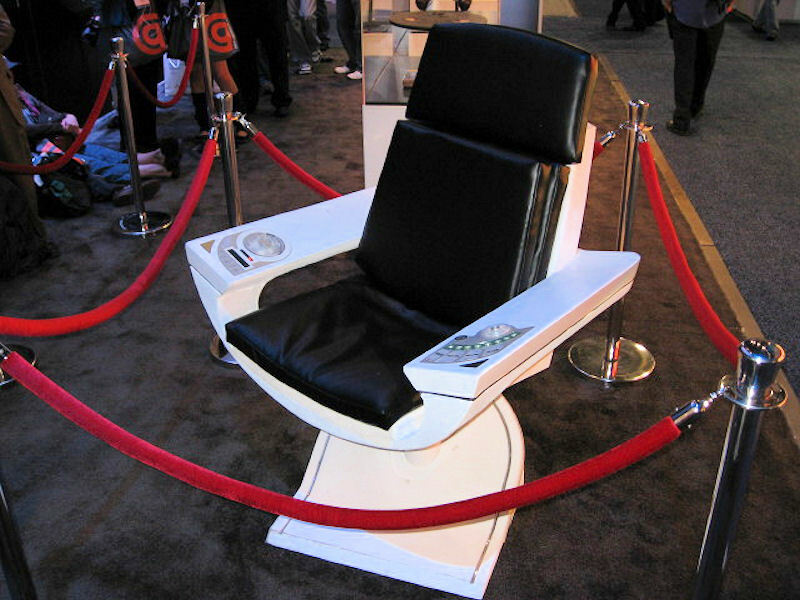 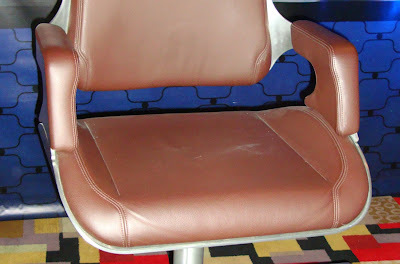 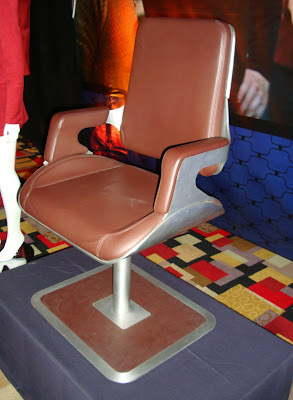 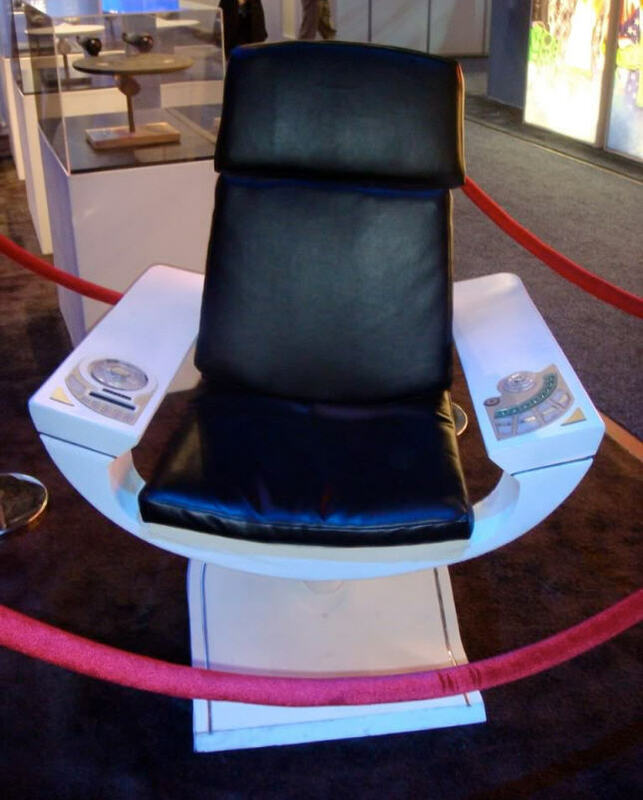 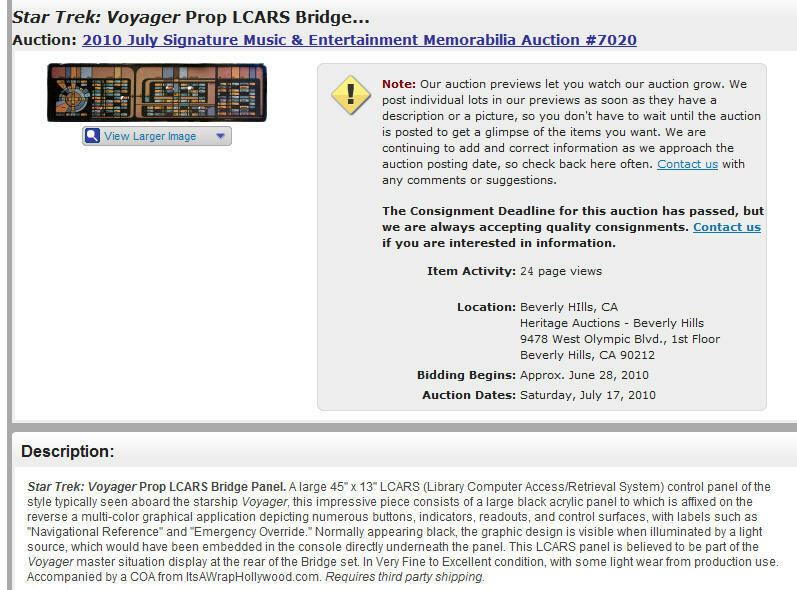 The Bridge Chair will be part of the Star Trek Auction, featuring property from the Estate of Gene Roddenberry, on June 27, 2010.